Those prepared to make a stand against Croatian border violence in the EU parliament are in the minority, with the rise of the far right across Europe. Evidence of Croatian police brutality as documented in a report by No Name Kitchen, SOS, and Balkan Info Van. Photo by Pablo Herrerías Valls. All rights reserved. In the orange glow of the evening sun, a steady stream of refugees can be seen returning to their makeshift encampments near the Bosnian border-town of Velika Kladuša. Some wear bandages from previous “push backs” from Croatia. 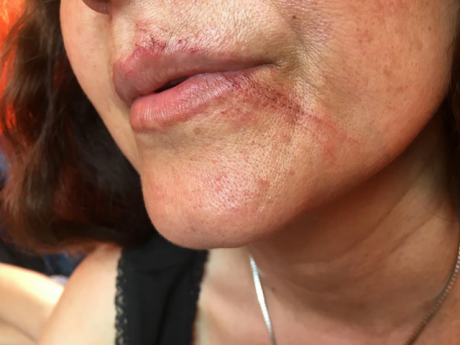 Others ask us where they might find treatment for newly inflicted wounds. “They hit me on the backbone” explains one man, lifting his shirt. Another refugee, recently returned from his first attempt to reach Italy, carefully rolls up his sleeve to reveal the bruises he sustained from his forced-deportation. As we write this article, refugees are being beaten, robbed and traumatised by Croatian police, while they attempt to claim asylum in the EU. Their clandestine journeys from Bosnia through to Italy, via Croatia and Slovenia, are referred to by refugees here as “the game”. But for many of the displaced people we talked to in north-west Bosnia, the violence of the border is taking a heavy toll. Thanks to the flagrant human rights violations of Croatian police – with the tacit complicity of EU authorities – “the game” is no laughing matter. A teenage refugee we met in Kladuša, named Abdul, who was severely disabled by a landmine explosion in Afghanistan, described how the police continued to beat him in Croatia despite his obvious impairment. “I tried to show them this…” he explained, pulling up his trouser leg, “…but they kept hitting”. We met him in an abandoned abattoir that the grassroots charity No Name Kitchen are using to provide hot showers, first aid, and clean clothes for refugees in the town. Abdul was trying to find looser fitting trousers, as his jeans were rubbing against his re-injured leg. It is not just adult men who have been attacked and deported from Croatia. In a recent report published by a coalition of grassroots NGOs, mothers describe being beaten while carrying their infants; and children as young as nine also report being subject to police violence. “When we arrived at the border, I said to my mum that I was cold…”, explained one child refugee in the report. Along with her family, she had been transported back to the Bosnian border in an overcrowded police van: “…She wanted to give me a jacket, but police were beating my mother.” They had been detained near the Croatian village of Slunj, and like many others had asked the police to claim asylum. Their appeals were ignored, their phones were smashed, and they found themselves back where they had started, on the wrong side of the EU border. Scratches on a female refugee’s face caused by a Croatian police officer during her violent ‘push-back’ to Bosnia. Photograph from border violence report by No Name Kitchen, SOS, and Balkan Info Van. All rights reserved. Other refugees we met who had made it as far as Slovenia and Italy, also report being handed over to the Croatian authorities for refoulement, which contravenes EU and international law. Despite mounting evidence of border violence against refugees in Croatia, an official statement from the Croatian Ministry of Interior flatly denied any “coercive means being applied to migrants by police officers”, and the Ministry described such reports as “unverifiable”. However, based on long-term reporting by NGOs and our own observations in the region, we estimate that up-to 70% of people detained and deported back to Bosnia have suffered instances of police violence. “If confirmed, these would be unacceptable violations”, said Italian MEP Elly Schlein recently in a statement that called for an investigation into the treatment of refugees in Croatia. 21 other MEPs, from 11 EU countries, have joined Schlein in requesting a parliamentary interrogation into these serious allegations. The Council of Europe’s commissioner for human rights has also written to the Croatian prime minister in an open letter, requesting a full investigation into human rights violation. But for refugees on the ground in Kladuša and elsewhere in Bosnia, such action is too little too late. Yet this illusion of sanctuary comes with a barbed reality: in order to seek the safety of asylum in the EU, displaced people have to navigate a gauntlet of peril. To the south of Europe, this means potentially drowning at sea. According to the UNHCR, in the first half of 2018, one in 18 refugees drowned attempting to cross the Mediterranean. In the Balkans, without the existence of a maritime border, seeking asylum in the EU means facing the danger of the Croatian police, as well as other hazards. Between January and August 2018, the UNHCR report that 26 people are known to have died while travelling through the Balkans. For refugees trapped on the edges of Europe, things are unlikely to get any easier. In the same speech Avramopoulos announced how the EU’s budget for border enforcement is set to increase; between 2021 and 2027 it will grow to €11.3 billion. “All these elements will continue to apply in full respect of fundamental rights and non-refoulement” he assured the audience of delegates in Brussels. But sitting in the makeshift camp in Kladuša, with refugees who had themselves been refouled and stripped of their fundamental rights, this image of tolerance and openness becomes a distant illusion. One of the reasons Croatia is using overt violence to enforce its border rests in its desire to join the Schengen free-movement zone. By some accounts this show of force may be working: in a recent meeting with Croatian Prime Minister Andrej Plenkovic, German Chancellor Angela Merkel praised how Croatia is handling migration issues, stating that: “maintaining the borders and police procedures are a sign that Croatia has made great progress.” With Croatia set to hold the rotating six-month EU presidency in 2020, it is likely that border politics will be high on the agenda. It would be a mistake to think that this is a Croatian problem however, for the boundary between Croatia and Bosnia is also the border of the European Union. Though this police violence may take place hundreds of miles from Brussels, Paris, or London, the violence is an intrinsic part of French, German, Italian – and British border policy. Yet as always, geopolitics have all-too human consequences. Only a short drive from Croatia’s Dalmatian coast, where thousands of tourists flock each year on holiday, Croatian police try to track down small groups of refugees making their way through the forest, attempting the ten-day hike to Slovenia. 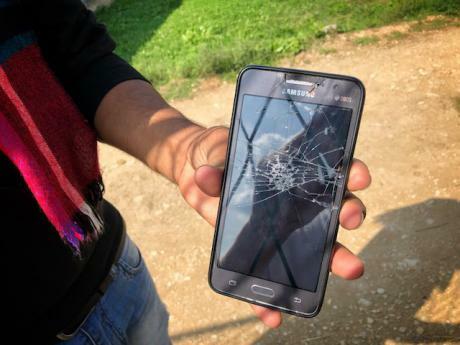 A refugee from Afghanistan shows his phone that was smashed by Croatian police during his attempt to reach asylum. Photograph by Thom Davies. All rights reserved. As winter approaches, there is a lot of uncertainty as to how refugees will be housed in Bosnia, and which organisations will host them. A senior member from the EU delegation to Bosnia explained to us that the country is ill prepared for the approaching winter. As soon as the mercury drops below zero, the donated tents and bombed-out buildings that currently house refugees will no longer fend off the cold. Despite pledges of funding from the EU, so far little concrete action has taken place. On the ground in Bosnia, it is not the EU that are offering “openness and tolerance” – but the Bosnian people: “They know how it is to be in those shoes, they know how it is to have nothing but clothes on you; having no food, no shelter” described one young Bosnian, whose parents became refugees in the 1990s. “That experience gives them an insight.” Indeed, during our research others described helping refugees with food and medicine; housing them in their homes; or helping them navigate the best route through to the supposed safety of the EU. Not only do those participating in “the game” have to bypass the border police, they also have to avoid the barbed wire and minefields that still remain from the Balkan conflicts in the 1990s, and the Cold War borders that once divided up this region. Back in the abandoned abattoir in Kladuša, the charity No Name Kitchen sets up improvised showers each morning, made from repurposed boilers, car batteries, electric pumps, and hose pipes; all held together on a shoestring budget and a determination learnt in the fields of Serbia, and the winters of Belgrade. If the generosity of the Bosnian people and the courage of charities like No Name Kitchen will be enough to keep people alive this winter remains to be seen. But one thing is clear, for refugees trapped in the Balkans, the Croatian border is a place of violence, and the EU’s virtues of openness and tolerance are just an illusion. It was first published at openDemocracy on 23 October 2018: https://www.opendemocracy.net/can-europe-make-it/thom-davies-karol-na-augustov-arshad-isakjee-jelena-obradovic-wochnik/violent-reality-of-eu-border-p (last accessed 30 October 2018). This entry was posted on 30 October 2018 by Antipode Editorial Office in Interventions and tagged Antipode Foundation Scholar-Activist Project Awards, asylum seekers, Balkans, borders, Bosnia, Bosnia and Herzegovina, Croatia, deportation, displacement, EU, human rights, international law, Italy, Mediterranean migration, No Name Kitchen, open borders, openness, police brutality, police violence, refoulement, Slovenia, tolerance.